Add effortless waves to your bob with hot rollers. When you make the leap to a chin- to shoulder-length bob, it's not a bad idea to add hot rollers to your styling routine. Hot rollers allow you to make the most of a mid-length cut. They add volume, shine and bounce to your hair without the need to stand around with the blow dryer and round brush for half an hour. Style your bob and create a long-lasting look with heated rollers. Plug in your roller set and allow it to heat up. Use rollers that are between 1 and 1 1/2 inches wide. Spritz dry hair with a thermal setting spray and comb it through from root to tip with a wide-toothed-comb. If you have difficult-to-curl hair, start on hair that was washed the day before, as it will have more grip. Divide hair into sections that are 1-inch wide, and clip each section to your head with hair pins. Curl short hair in smaller sections for more visible results. Remove a section of hair at the crown of your head from the clip, and place a roller underneath the section about 3 inches from the end. Wrap the ends of the hair around the roller, moving away from your head until the tip of your hair is on the roller. Turn the roller toward your head until it reaches your scalp, and secure it in place with the roller clip. Repeat the process on all sections on top of your head, then finish with the sections below your ears. 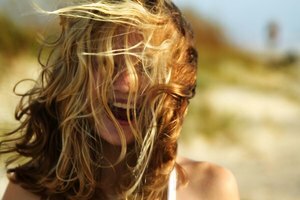 Allow your hair to cool completely, about 10 to 15 minutes. Hold a can of light-hold hairspray about 10 inches away from your head, and coat your hair evenly while still in the rollers. Remove the rollers from your hair and gently comb through them with your fingers to loosen and shape as you like. Pour a dime-sized-amount of anti-frizz serum into the palm of your hand and smooth it over your hair, concentrating on the ends. This will add shine and help to block out frizz throughout the day. If you find that the curls are tighter than you'd like, use a natural-bristle brush instead of your fingers to loosen them. O'Neil, Celeigh. "How to Style a Bob With Heat Rollers." 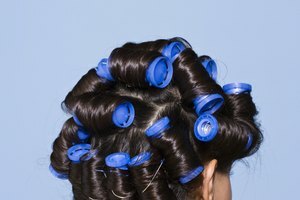 Synonym, https://classroom.synonym.com/style-bob-heat-rollers-20124.html. Accessed 24 April 2019.